I was recently invited to join the panel for judges who judge the United States Parachute Association National Championships. (I am a qualified skydiving judge, people don’t just get invited off the street to help determine who will represent the US at international competitions!) The Nationals (as they are referred to in short) were held at Skydive Chicago’s dropzone this year, which is about an hour and a bit outside Chicago by car in the town of Ottawa, IL. Usually I only visit the towns in which dropzones are based on bad weather days. Sunny days are spent skydiving. However on this occasion, I was expecting to be sitting in a room watching videos and scoring the points which competitors presented me with and I left my parachute at home. So when the competition finished earlier than scheduled, three of us went into Ottawa to explore the city while it was sunny. 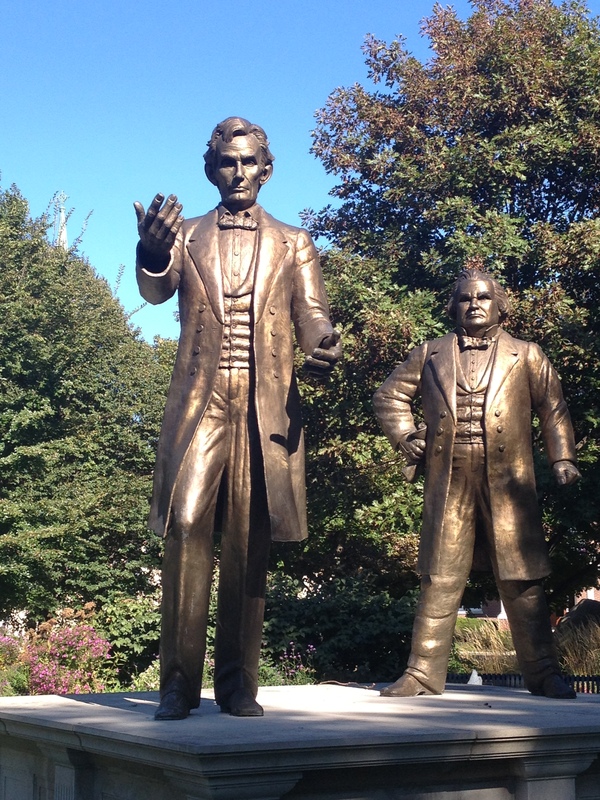 In the old town is Washington Square, where Abraham Lincoln (Rep.) and Stephen Douglas (Dem.) had their first of seven public debates when they were standing as candidates for Senator to represent Illinois. I liken this series of public debates to the presidential debates broadcast on national television these days, using the communication methods of their time. 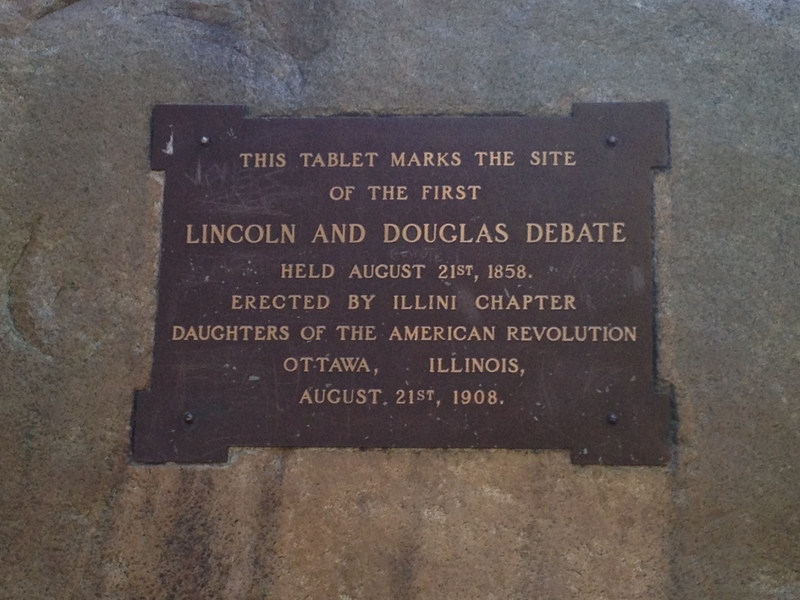 The statue above and plaque below commemorate this historic event. The same park also has war memorials remembering the deaths of soldiers from LaSalle county during the American Civil War, World Wars I and II, the Vietnam war and the Korean war. The names carved into the stone erected for the Civil War dead are starting to erode away, so in 2006 all the names were copied onto newly carved stones which were placed around the old memorial and and the memorial was rededicated.